Puerto Rico may be a small island (it’s about 100 miles long and 35 miles wide) but you'll find everything you could want in a tropical location and more. 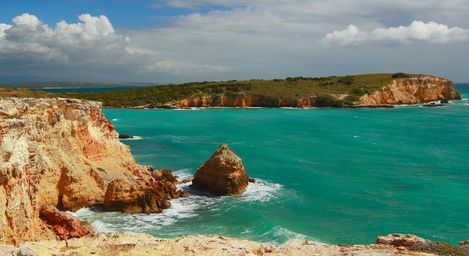 Puerto Rico brings you the best of the Caribbean: over 270 miles of white-sand beaches, balmy temperatures throughout the year, tropical flavors and rhythms, and of course, plenty of rum! Puerto Rico is renowned for its warm hospitality; fantastic climate and exotic allure that make this beautiful Caribbean island an exciting meeting and incentive destination. Plus, it has the key advantages of being an easily accessed U.S. Territory where English is an official language, the U.S. Dollar is the currency and where U.S. citizens are exempt from the passport requirementsthat otherwise encumber travel to and from other Caribbean islands and the United States. The climate is Tropical Marine with a regular daytime temperature of 82°F. Puerto Rico enjoys warm and sunny days most of the year. Lightweight clothing is appropriate year-round. The El Conquistador is situated on the northeastern end of the island where gentle trade wind breezes make it even more of a paradise! Puerto Rico is a U.S. territory and the U.S. dollar is the official currency; U.S. citizens don’t need a passport or a currency converter! The largest mall in the Caribbean is San Juan’s Plaza Las Américas. It houses the largest J.C. Penney store in the world, as well as the highest-grossing Sears store in the world. All doctors in Puerto Rico are board certified to U.S. standards.